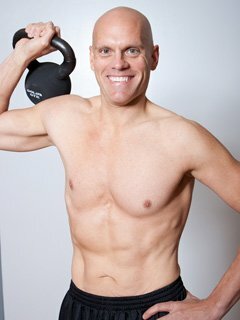 The New Mr. Clean -- The Clean Eating Plan For 50lbs Of Fat Loss! 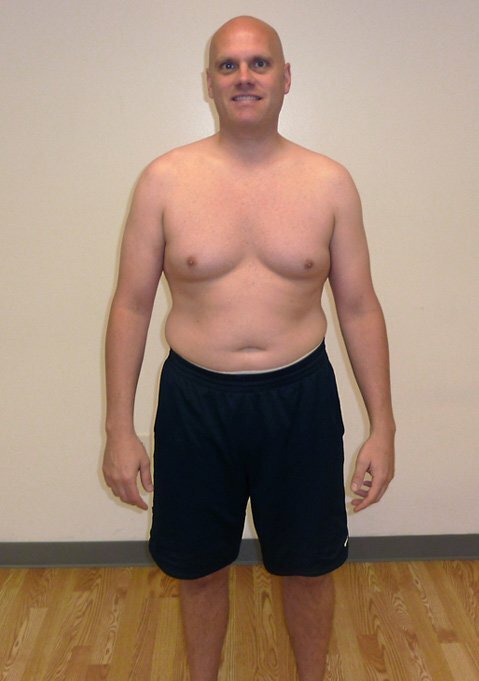 Mike lost 50 pounds in just 4 months. Read on to see how he changed his attitude about fitness and made the committment to get healthy. I had gone through a difficult period in my life that began in late 2006. By spring of 2010, I gained a substantial amount of weight and my health and self-confidence were at an all-time low. I used food and alcohol to try to get me through some tough times instead of making good choices. When I got on the scale in March of 2010 and it read 220 I knew it was time to make a change. At 44-years of age, I realized it was only going to continue to get harder and escalate if I didn&apos;t do something about it. I had two friends who had gone through the transformation process with Micah and HitchFit, so I called him and asked for his help. The only weight gain in this photo is the kettlebell. In June of 2010, I began my transformation with Micah. I was hesitant and completely embarrassed when I began, but Micah was so incredibly supportive and encouraging. That first day I couldn&apos;t even do 5 push-ups. We worked out together 2 times per week for an hour at a time. Those workouts were something I never experienced before. He taught me about intensity and constantly changing things up. We never did the same workout twice in those months. I also did a considerable amount of cardio during that time to burn the fat and change my metabolism. 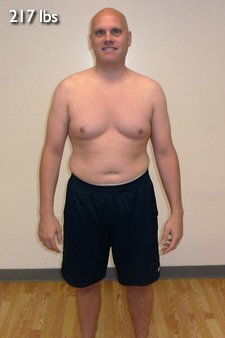 I tried to burn an additional 3500 calories a week spread out over 5-6 days. My diet was something I really let slip, so with Micah&apos;s help I learned a new way of eating and how to make much better choices. The days of pizza and beer were replaced with grilled chicken and fish, veggies and protein. I began to feel so much better in a short amount of time that it kept me motivated to get to that next level. A proper diet keeps those calories a-burnin&apos;! The only supplement that I took the entire time during my transformation was Quattro chocolate protein powder by Magnum. I would try to eat 3-4 small meals per day and then supplement those meals with 2-3 protein shakes per day. My transformation with Micah ended in October but I still take the Quattro on a daily basis after I lift and between meals. I used the change of lifestyle and foods to help me with my supplements, supplements alone were not going to get me there, but rather my changes in everyday choices, hard work and eating right. My diet needed a major overhaul. When I started with Micah, he gave me some guidelines to follow. Breakfast for me used to be a bowl of cereal at best. From day 1 of my transformation I began to eat 4 slices of lean turkey bacon, 4 egg whites and 1 whole egg, scrambled and 1/2 cup of oatmeal. I am still eating that same breakfast everyday and it is such an important start to my day. When I am travelling and not able to eat like this in the morning, there is a noticeable difference in how I feel. Lunch for me is 6-8 oz. of lean turkey or chicken breast, a serving of quinoa/brown rice and a small salad with no dressing. Dinner is grilled/baked chicken or fish, roasted or steamed veggies and salad. I supplement those meals with the protein shakes trying to eat every 2-3 hours especially when I&apos;m lifting. I started realizing that food needed to be looked at as fuel, I kept my diet balanced and I kept myself full all day long. This kept me with tons of energy and made me strong in the gym. Every day was different for me. We would always mix things up to confuse the muscles by using techniques such as drop sets, supersets, tempo training, rest-pause reps and negatives. Believe in yourself and give it everything you have. You won&apos;t regret it. If you are having trouble on your own, find someone that is qualified to help you and that does it the right way. No gimmicks or shortcuts - just all natural, hard work in the gym and good choices with your diet. For more information on Hitch Fit or personal training with Micah LaCerte visit www.HitchFit.com for online weight loss programs available worldwide, or if you live in Kansas City and are interested in one on one personal training visit www.HitchFitGym.com. Visit Micah&apos;s personal website at http://www.micahlacerte.net or write to mmlacerte@yahoo.com.